I love to plan and I'm really good at it! I plan trips to the store. I plan things at church. I love to organize as well! I organize the shelves in my pantry. I organize the sheets (by size) in my closet. Of course all of my family’s clothes are organized! I organize all of my school supplies. I have all my books organized. As a mom, perfectionism is torture. Having everything perfect is impossible with children. Any mom can tell you that. Whether you have one child or ten, perfectionism seems harder and harder to grasp. As we added each child I felt control slipping slowly through my fingers. My meals no longer included rare and different ingredients. Most of the time, four o'clock rolled around and you could see me staring into the fridge wondering what I could make with the sparse ingredients inside. My household chores were done haphazardly with no amount of routine. I did laundry almost every day. I had to rewash it several times because I would forget it in the washer. My floors looked like someone had crushed every type of cookie and sprinkled the floor with the crumbs. I went to bed late. I got up early. I felt tired and worn down. I was worried, anxious, and very irritable. Life was a mess! I prayed for peace and got nowhere. A few weeks and months went by. I used the binder. I did the activities. We stuck to the routine. I made the meals that I had planned. My chores fell into a schedule. Yet, I still felt tired. 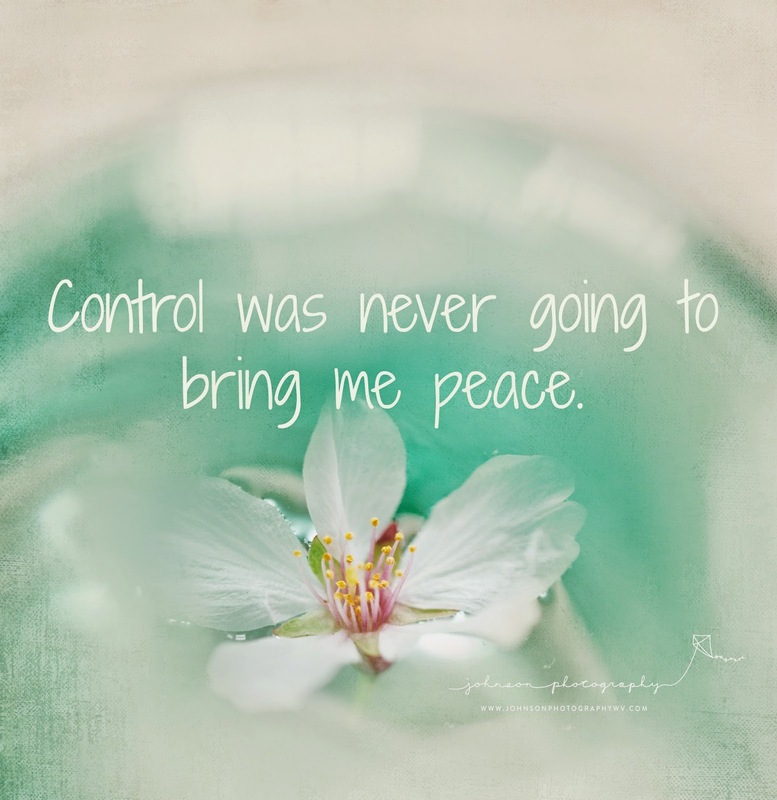 I felt even more irritable and still felt peace was missing. Then God began to speak to my heart. Being perfect and controlling everything around me was an illusion. Control was fight I would never win. Every time I swept, not even ten seconds later, a pile of crumbs from who-knows-where would appear! The clothes never stayed clean! My family needed three meals a day: everyday! No matter how many times I would wipe a mouth, it would still be caked with food as we walked out the door. Peace is more than a feeling...it is a settled calm. I wanted that. I knew life was going to be crazy and messy. No one’s life is without complications. In Judges 6:23, Gideon is afraid of the task God has called him to do. God sends the Angel of the Lord and says: “Peace be with you; do not fear, you shall not die.” Judges 6:24 says, “So Gideon built an altar there to the Lord, and called it Jehovah-Shalom (The-Lord-Is-Peace).” Gideon trusted those words. He believed that God would protect Him. His heart was content with God and confident in His promises. We can have peace when we are content with God and confident in His promises. God has called all of us to do a task. For me, it is mothering. God tells me: “Peace is with you; do not fear.” I need to build a little altar in my heart and allow God to be my Jehovah-Shalom. I need to be content with God's promises and confident that He will keep His promises. Peace comes from knowing God. I have found great peace in resting in the assurance that I am not perfect and that is OK. Peace is one of the Fruits of the Spirit. God’s Holy Spirit is there to provide peace – that settled calm. I have found peace in believing God will do what He says He will do and is who He says He is. My life is still crazy. My kids still scream over everything. My house looks like a warehouse for broken toys and stacks of paper. My kitchen pantry is an explosion of opened cracker boxes and cans of cream of chicken soup. Please do NOT look in my junk drawers (yes, that’s plural). I still love to organize and plan. I still use my meal-planning guide (found here). I keep recipes on Pinterest. My schedule for cleaning has loosened, although Mondays seem to be the best for laundry. My binder is sitting on a shelf in my pantry looking lonely. I haven’t opened it in months. I can have peace when I am content with God and confident in His promises. God, please write these truths on my heart! What an encourager you are, Sarah!